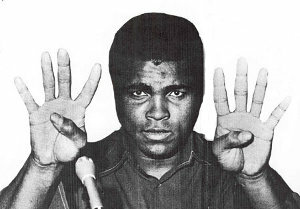 Muhammad Ali is celebrating his 70th birthday in 2012. What a great opportunity to study his hands! Besides quite a few photos, I was able to find a cast of his right hand. What surprised me the most was the shape of his palm, which is rectangular, i.e. longer than it is wide. From a boxer’s hand, I would have expected the wider hand of a more physical being. Muhammad Ali – then Cassius Clay – graduated last of his class, yet he expressed himself very eloquently, sometimes in verses. This was probably the result of his long palm and long fingers, fueling his energy in a more intellectual manner. Both his Mars negative and Mars positive mounts are full, giving him a perfect balance of physical vitality and mental stamina to stand his ground, both on the ring and in his life; for instance, when he refused induction into the U.S. Army due to his religious convictions. Despite difficult times in his career, he was able to turn things around and shine like a star. Interestingly, the tip of his Jupiter (index) finger is bent toward the middle finger. Usually, such people have a sense of shame and guilt and tend to criticize others because this is the way they have been treated in childhood. Ali’s fingernails are very wide, covering well the fingertip. This is the sign of an excellent nervous system. While acting in a very exuberant manner, Muhammad Ali once had his blood pressure checked: it was totally normal. The mount of Venus is very round, emphasized by a curved life line, showing his excellent health and legendary vigor. However, Venus is not supported by an equally strong mount of Luna. It indicates that his perception of life is not as accurate as it could be, maybe because of some unexpressed fear. On the cast, the heart line can be seen diving toward the head line. Despite his assertiveness, he has difficulty trusting others and he may be afraid to get hurt emotionally.